It is, by no means, clear that the first Russian Mistral won’t be delivered when it’s due at the end of October 2014. Maybe it will be just quiet enough on the eastern front of Ukraine for Paris to fulfill its contract with Moscow. 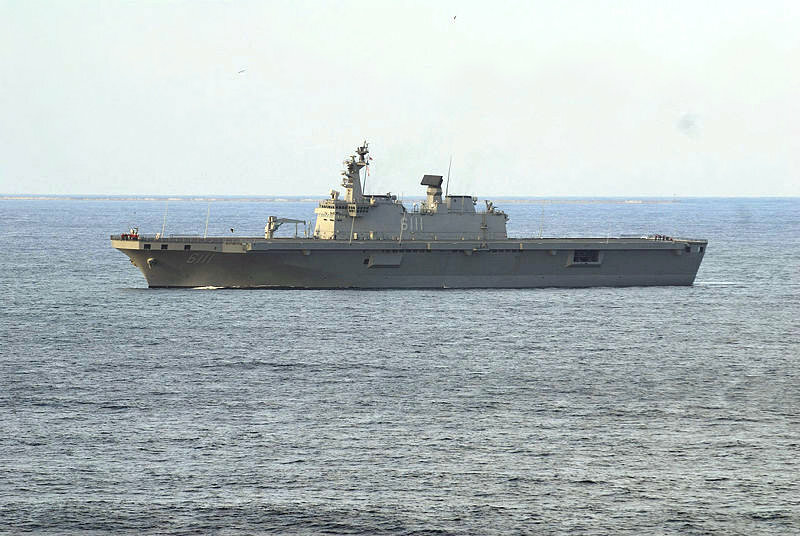 But CAST’s Andrey Frolov suggests in a recent VPK article that, if the first Mistral isn’t delivered, Russia could team with South Korea to build its own LHD at Zvezda shipyard in Komsomolsk. Russia’s shipyards are so busy with naval and civilian orders that laying down even two LHDs seems improbable, according to Frolov. Nor, with sanctions in place, does Frolov think it’s realistic to believe that Russia can obtain all the dual-use technology it needs for such ships. It’s also doubtful it can develop its own. And the cost of these ships is a large issue. But, says Frolov, the possibility of foreign cooperation remains. European partners are already irrelevant because of sanctions. Daewoo Marine Shipbuilding and Engineering (DSME), however, already partnered with Zvezda in an effort to land the contract Mistral won. Frolov believes Russia and South Korea have similar views for an LHD: a ship for littoral operations close to home rather than for transoceanic expeditionary warfare. Russia would have to develop some equipment, components, and systems for a Russified Dokdo to replace U.S. ones that Washington would certainly not permit the South Koreans to provide to Moscow. Frolov reminds that Russia already has a record of weapons development cooperation with Seoul. For example, the Russian radar developed for the ROK’s KM-SAM will be used on Russia’s new Vityaz SAM. He concludes that a Russian-Korean LHD could become “a more threatening player on the world arms market” and fill Zvezda’s construction program. The deal for the first two Mistrals, that is. With President Medvedev looking on, Rosoboroneksport’s Anatoliy Isaykin and DCNS’ Patrick Bouasie signed the contract at the Petersburg International Economic Forum. RIA Novosti quoted Isaykin on the €1.2 billion price. Work can begin after the Russians pay an advance (Versii.com repeated a rumor that the French wanted 80 percent prepayment). RIA Novosti also noted Isaykin saying the Russian Mistrals will be identical to French units except they’ll have reinforced hulls and flight decks to handle Russia’s northern waters, and its heavier helicopters. Isaykin said Russia has an option for two more Mistrals to be built in Russia. But it’s up to the Defense Ministry to get money for them in the Gosoboronzakaz. Kommersant reported the first Russian unit is expected in 36 months, the second in 48, or 2014 and 2015 respectively. It cited Trotsenko on Russia contributing up to 40 percent of the work on the two ships to be built at STX in Saint-Nazaire. While the Mistrals will come with French electronics, the Russians will have the task of outfitting the ships with their own weapons, helicopters, amphibious assault craft, and other systems. Aleksandr Golts supports the deal because Russian shipbuilders will participate and get new technologies, but he also because he favors the emphasis on force projection rather than the Navy’s pro-SSBN mission. Navy CINC, Admiral Vladimir Vysotskiy made some appropriately effusive comments about the capabilities and prospects for employing the Mistrals. 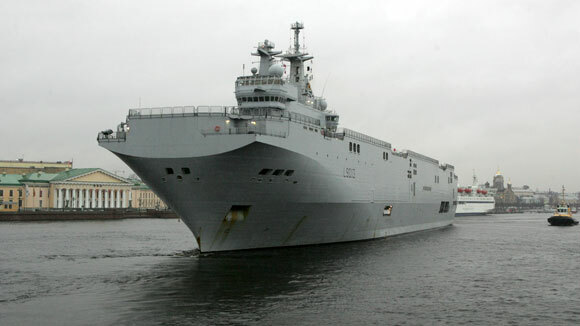 The Elysee announced Sunday that French President Sarkozy and Russian Deputy Prime Minister Igor Sechin will sign the Mistral contract in Saint-Nazaire today. InoSMI.ru and Militaryparitet.com provided the story from Le Point. Sarkozy and Sechin will inspect the Mistral and Tonnerre, as well as the Dixmude, which is still under construction. Le Point says the Mistral deal was originally entrusted to oligarch shipbuilder Sergey Pugachev and his holding company United Industrial Corporation (OPK), and rumors circulated about French and / or Russian middlemen receiving commissions for brokering it. Ultimately, Russia’s United Shipbuilding Corporation (OSK) — headed by Sechin — took over negotiations with Paris. Le Point claims the Russians asked the French to provide Link 11 and Link 16 combat information systems along with Mistral. The French demurred, saying transferring these NATO systems required the agreement of all 27 alliance members. Moscow reportedly persisted as recently as the NATO-Russia Lisbon Summit, saying this equipment would support its participation in joint operations with NATO. Its request is formally being studied, but won’t be approved, according to Le Point.